[0:45] <schone> im trying to qemu the raspbian image and trying to start it with minimal boot (init=/bin/bash) results in a hanged qemu saying “Uncompressing Linux... done, booting the kernel." [0:46] <schone> is this a familiar symptom to anybody? [0:56] <plugwash> schone, what happens if you try init=/bin/dash ? [0:58] <Stmeter> The problem I'm having if anyone doesn't mind taking a look, http://www.raspberrypi.org/forums/viewtopic.php?f=28&t=89429&p=627739 In addition, when I run wiringPi's pintest, the board shuts off. [1:07] <shiftplusone> rawf, what plans have you got for it? [1:08] <rawf> For now, I'm hooking it up to my favorite tube TV to play videos on. [1:08] <rawf> Later I might buy more parts and use it as my primary computer. [1:10] <rawf> how would I blow out the GPIO? [1:10] <shiftplusone> You don't need to be too creative to do that. [1:11] <shiftplusone> Just hook it up to mains or short it out for a while. [1:12] <shiftplusone> Thanks to him, the practice of killing one's pi shortly after getting it is called to pull a daniel. 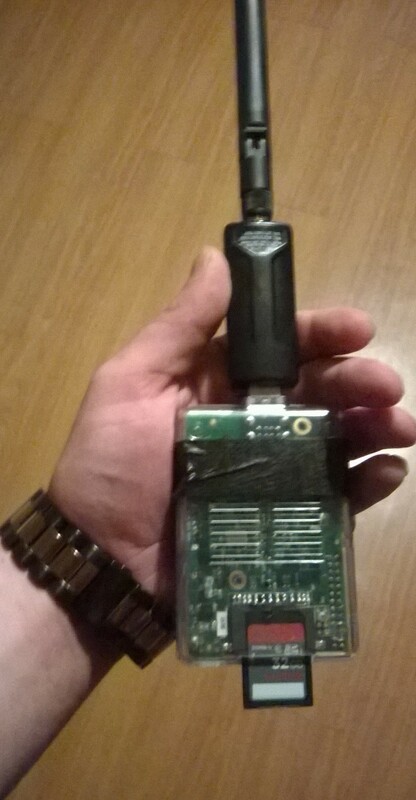 [1:12] <Stmeter> Got my PI yesterday and I'm pretty sure that's why I'm running into hell. [1:12] <rawf> well, the fan is already connected properly. I'm not attaching anything else to it in the near future and will surely be cautious when I do. [1:12] <shiftplusone> Stmeter, sounds more like you've got it wired up wrong. [1:13] <Stmeter> shiftplusone, no harm in checking though? [1:13] <rawf> Sir_Pony: you mean, like the fan's motor? [1:13] <shiftplusone> Stmeter, no harm, but no way either. [1:13] <Stmeter> shiftplusone: Hmm would you mind if I posted a picture? [1:14] <schone> shiftplusone: is there somn else i can use thats close enough that would enable me to get into the X11 graphical interface? [1:14] <shiftplusone> Stmeter, I'm off to bed, so I'm not really going to be able to help. [1:14] <Stmeter> shiftplusone: Thanks anyway, I'll post it and see if anyone has input. [1:14] <shiftplusone> schone, what kinds of things? [1:14] <shiftplusone> schone, I MAY have a 3.12.28+ here somewhere... sec. [1:16] <rawf> Sir_Pony: ah, good. You scared me. [1:16] <Sir_Pony> I got that case too. [1:16] <rawf> did you connect it to the 4 and 6 pins? [1:17] <rawf> would that be bad? [1:18] <rawf> sadly, I'm a software freak. It is shameful how little I know about actual hardware ._. [1:18] <schone> shiftplusone: another question I have… i got this SD Card here that already had raspbian on it but i want to overwrite it with my new and improved one i baked in qemu… its got 4 partitons on it all in ext2… how can I format it and make it one partition and dd the image into it? [1:18] <rawf> then... do you have a similar case then? [1:18] <shiftplusone> schone, you'll need to do a bit of a shuffle. [1:19] <schone> shiftplusone: how so? [1:19] <shiftplusone> schone, do you intend to use it on a pi? [1:20] <shiftplusone> schone, then you'll need to create a new image and transfer the files across. You can mount images by specifying an offset. fdisk and losetup can be used to partition a blank image and format the filesystems on it. [1:21] <schone> shiftplusone: let me first get the image baked the way i want it and then ill come asking how to do the repartition is that ok? i have a slight emergency at work that i must attend, im so sorry! [1:21] <shiftplusone> anyway... nap time. [1:29] <shiftplusone> schone, just updated the kernel and it's compiling. Will give you a link when it's done. [1:29] <schone> shiftplusone: thank you much! [1:30] <shiftplusone> schone, out of curiosity, why didn't you compile it yourself? [1:31] <shiftplusone> schone, I've got a tutorial on xecdesign.com which seems to still be enough. 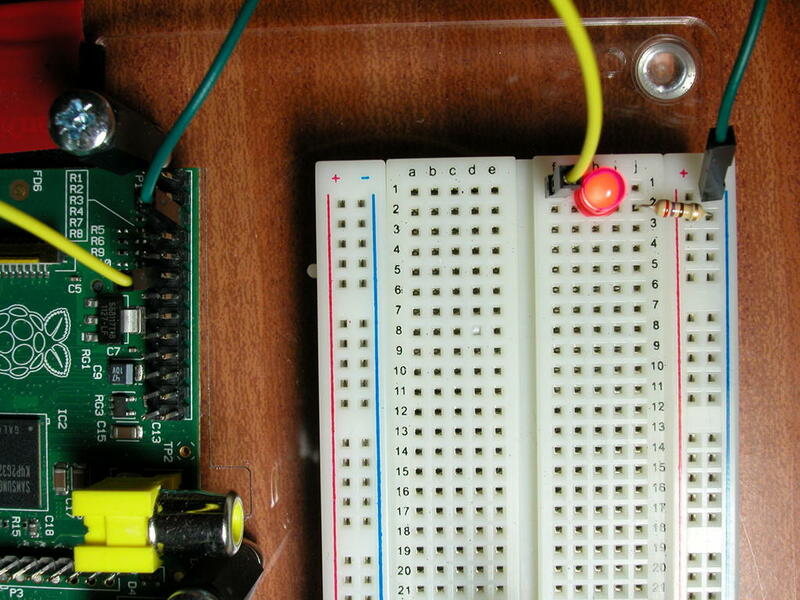 [1:34] <Stmeter> https://projects.drogon.net/wp-content/uploads/2012/06/example2.jpg Shouldn't the LED light up if connected like this? [1:34] <Stmeter> Mine isn't working at all. [1:35] <shiftplusone> schone, I've just noticed the kernel I'm compiling is 3.12.30, sorry. Too sleepy for this. 'night. [1:35] <WACOMalt> IS there any way to use a Raspberry Pi SD card for other stuff too? I have a microSD I use in my phone (exFAT) Id like to also keep the Pi's files on this and be able to boot from it. [1:36] <shiftplusone> Oh, tomorrow is Saturday =). Will get on top of it and update things as required. [1:36] <WACOMalt> does rpi's card have to be fat32 or something? [1:36] <ShorTie> sure the led is not in backwards ?? [1:37] <WACOMalt> OK, so if I shrink my exfat and add a fat32 to the head of the drive, that oughta work? [1:37] <shiftplusone> no harm trying. [1:43] <rawf> WACOMalt: windows will only mount partition 1 IF it is a windows compliant FS. All other partitions on a removable disk will be ignored. [1:44] <WACOMalt> I hope, linux is better about that right? [1:47] <Frigid_Cryotank> by some wild chance... has anyone tried compiling OpenSimulator for an RPi? [1:48] <chod> open siumulator for? [1:52] <WACOMalt> if I want to expand this across the whole card, which should I expand? [1:53] <slvmchn> stupid question, i want to use a powered hub to power some usb devices, is it possible to plug the hub into the pi via usb, then power the pi from the same hub? or will the pi try to see itself as a device and freak out? [1:53] <[Saint]> it'll likely take seven years to compile, and run like a bag of arse when if does. [1:54] <[Saint]> slvmchn: pi doesn't do host mode, so, no - that's fine. [1:54] <rawf> huh... how do I power down the pi cleanly..? [1:54] <taza> rawf: Have the OS issue a shutdown? [1:55] <Frigid_Cryotank> [Saint]: I dunno. The Windows-based simulator doesn't take much away from the CPU when running..
[1:55] <Frigid_Cryotank> Maybe 10% of the processor. [1:55] <Frigid_Cryotank> Well, that's what Task Manager reports, anyway. [1:55] <[Saint]> On a _much_ more capable machine, I posit. [1:57] <Frigid_Cryotank> [Saint]: <groan> Yah. 10% of a P4-630 @3 ghz w/3 GB. and compiling on the RPI, even with external USB hdd, could take a ..while. [1:58] <rawf> NUUUU... I need to come up with a new computer name..
[1:58] <Frigid_Cryotank> rawf: THere you go: NUUUU looks good to me. [2:00] <[Saint]> even if you managed to compile this, I'm not convinced a pi wouldn't choke on it. [2:00] <[Saint]> I mean, its a pretty snappy little GPU, but, its not /that/ good. [2:01] <[Saint]> Minecraft runs just slightly bettery than "absolutely terrible" on it. [2:01] <Frigid_Cryotank> I don't mean the client portion. The server side doesn't need X or the graphics stuff. [2:01] <Frigid_Cryotank> The server side is open source. [2:02] <Frigid_Cryotank> http://www.osgrid.org has downloads of server binary... but I've never tried compiling the server side. [2:05] <[Saint]> This thing HATES me. [2:05] <[Saint]> I managed to brick a phone no more than half an hour after purchasing it yestersay. [2:06] <Frigid_Cryotank> Did you send the procedure to the developers? I'm sure they'd like to know. [2:06] <[Saint]> Now I have to write my oen toolset to repair the little bugger. [2:07] <[Saint]> I won't tell them about the exploit path until I get another one and verify that they won't be able to close it up easily. [2:08] <[Saint]> Telecon NZ is mildly receptive. [2:09] <[Saint]> Vodafone NZ just doesn't wanna know about it and sends out vaguely threatening emails. [2:09] <Frigid_Cryotank> Why not approach it the same way as that exploit with USB thumb drives? [2:20] <[Saint]> Firefox OS is _ridiculously_ non-intensive. [2:20] <Frigid_Cryotank> ?? I'm thinking of Firefox the web browser. [2:20] <[Saint]> Its actually specifically designed to run oh hardware akin to the pi. [2:21] <[Saint]> Firefox (actually iseweasel) runs like a bag of crap on the raspi. [2:21] <[Saint]> actual FF even worse. [2:22] <Frigid_Cryotank> <heh> So they did it because it was a challenge? [2:22] <[Saint]> They didn't do it at all, as far as I'm aware they had no hand in any such thing. [8:50] <evil_dan2wik> no its not. [8:50] <evil_dan2wik> you are weird. [8:50] <evil_dan2wik> I electrocute mine, it goes to sleep forever. [8:50] <ShorTie> y 4 u say that is how you break sdcards ?? [8:53] <jeezy> what do you suggest ? [8:55] <jeezy> where can i get one of these? [8:55] <ShorTie> or just get a B+, it has it built in, hehe. [8:56] <jeezy> evil_dan2wik: what do you run OS-wise on your main PI? [8:58] <jeezy> B+ has the same amount of ram? [8:59] <jeezy> i would love to see a 1GB ram pi! [8:59] <evil_dan2wik> but those people are looking for something like a low power computer. [9:04] <ShorTie> sorry, your are right, guess not enough coffee yet, lol. [9:15] <benxyzzy> Is there a common, go-to controller for hassle-free use with Pygame on Raspberry Pi (plug-and-play / no futzing with setup) is my top priority)? [10:58] <lag> Does anyone know who PopCornMix is? [11:04] <ShorTie> not personally, but i think he works at the foundation maybe, why you ask if i can ask ?? [11:34] <evil_dan2wik> I want to screw around with the Pi kernel. [11:34] <lag> evil_dan2wik: Is that a twisted-quote or a genuine request? [11:35] <evil_dan2wik> I have nothing else to do right now. [11:36] <evil_dan2wik> but, how will that break the SoC? [11:36] <evil_dan2wik> how would it overheat? [11:36] <lag> evil_dan2wik: Not quite sure why you'd want to disable Panics though? [11:37] <evil_dan2wik> because why not? [11:40] <evil_dan2wik> why would it be difficult? [11:46] <grammoboy> �s it possible to autoconnect wii controller? [12:51] <evil_dan2wik> or, it could just freeze. [12:53] <evil_dan2wik> Point is, something is causing the panic. without a panic, the system continues to run and the bad data the caused the panic is still in there running. [12:55] <evil_dan2wik> until eventually, the system grinds to a corrupted halt. [14:40] <niston> its teh evil spawn from hell. [14:43] <evil_dan2wik> niston, it tries its best. [14:54] <evil_dan2wik> is there a way to install everything? [14:55] <[Saint]> that should, in theory, work. [14:55] <[Saint]> but it would be amusing, and I'd wonder how it would pan out. [14:56] <[Saint]> some packages are going to have very specific requirements and will probably end up rejecting packages that others want as dependencies. [14:57] <[Saint]> it would take some fairly cafeful monitoring to make sure it actually all /worked/. [14:57] <evil_dan2wik> A couple days of installing, A load of conflicting, and then probably end up with a full filesystem at the end of it. [15:54] <mateusz> Hi, during the instalation of raspberrian i've choosed console environment, but wondering if GUI was installed, and I can run it now, or I need to install it...? [16:11] <lag> Does anyone have Occidentalis running on B+? [16:35] <Balzy> Hello! I'm running a small server with a Pi and I'm trying to boost a bit its performances. I've read a good mass memory device (instead of a cheap slow sd card) could make a difference. What do you think? Is it true? Could a poor sd card be a sort of bottleneck? [16:50] <Balzy> So what device would you suggest me to use? A high speed Micro SD? usb stick? usb external HD? [16:50] <Balzy> What could be a good and cheap solution? [16:57] <sine0> the hdmi and play from a usb ? [17:01] <Balzy> ShorTie so you say I wouldn't benefit from an higher r/w speed sd card? [17:08] <NedScott> sine0: OpenELEC. OpenELEC contains XBMC. It will fit on a 2GB card. [17:09] <mikroskeem> hey how could i set i2c clock speed? [17:52] <sine0> NedScott: and then i can put in a usb with the food on it right ? [19:02] <NedScott> sine0: are you using their Pi specific install instructions? [19:04] <NedScott> sine0: do you know how to use the DD command? [19:08] <grammoboy> it seems not easy to get mplayer or vlc running on the rpi, is that right? [19:12] <sine0> NedScott: dont loose your cool now! [19:12] <sine0> if I use dd to transfer an image over to sdcard does the sdcard need to be mounted? [19:15] <freebeer> should it have the partition number? [19:15] <grammoboy> is it possible to use xbmc headless and control it via remote app? [19:32] <sine0> does the sdcard have to have the boot flag set ? [19:33] <ShorTie> what os is your main pc if i can ask ?? [19:40] <noderoamer> can anyone point me to someone or a group that can help me with running a .NET program using mono on a raspberry pi? [19:48] <noderoamer> did it get cruppted? [19:49] <MY123> sine0: after an rpi-update? [19:49] <noderoamer> have you ran a fsck? [19:50] <sine0> I did a few things wrong. [19:50] <sine0> the write script failed because ii have the card set to write protection..
[19:53] <noderoamer> did you check the MBR? [19:54] <rawf> Has anyone here tried running archlinux arm on their pi? [19:54] <noderoamer> ok are you using *nix win or mac to write the card? [19:55] <noderoamer> what size is the card? [19:56] <noderoamer> what is the /dev/ path? [19:57] <sine0> what, not sdb1 ? [19:58] <gregor3005> 2048M as blocksize????? [20:00] <noderoamer> I was where you were 6 months ago. I know enough to use mostly cli. [20:01] <sine0> still that command, yea ? [20:02] <PovAddict> hold on, why do you want to null it? [20:15] <sine0> PovAddict: lifesaver thanks. [20:22] <shiftplusone> gregor3005, I tend to pull the source from github and compile the drivers on the PC, then transfer it over. Much faster that way. [20:48] <dougpiston> hello, just upgraded from textual 5 preview 7 to the 5.0.0 posted on the twitter account. scrolling seems a bit laggy. is there something I am supposed to do? manual intervention? [20:52] <TheSnide> is there a use for going to + drivers intead of pure raspbian ones? [22:26] <novec> Hey. Can anyone give me some help trying to compile the lirc_zilog module on the raspi? [22:37] <rawf> is omxplayer the best way to play video on the pi? [22:37] <shiftplusone> rawf, 'best' depends on your use case. There's also VLC (which you'll need to compile yourself) and xbmc. [22:38] <shiftplusone> I like omxplayer because there's no nonsense. It plays a video... that's all I need a video player to do. [23:34] <tunmkr> anyone done something like this ? [23:36] <NedScott> is this analog video capture? [23:37] <NedScott> what kind of USB capture card is it? do you have a link?